The ultimate manure production system. Horses have evolved on the plains, steppes, tundra, moors and savannahs of the world to continuously ingest small amounts of low-grade forage - often for 16 hours or more each day and they cover a lot of ground at the same time. Their digestive system is not well suited to concentrated feeds, which can be a challenge in many horsekeeping models. The constant presence of digestive acids in their systems also creates difficulties for horses who are fed only a few times every day with long periods with nothing to eat. In modern times, the picture of the ideal equine habitat is often depicted as a lush grass monoculture, but in fact that does not resemble the habitat where horses evolved. In the wild, they travel on pathways and tracks through their territory and forage over large areas on sparse grasses, herbs, shrubs, barks and mineral sinks. The constant movement is not only necessary to access all of the required nutrition, but is also beneficial to the healthy function of the digestive tract, circulation, hooves and body in general. Standing in a lush pasture and gorging on a rich monoculture of grass day after day can be a recipe for problems like laminitis, obesity and digestive upset. Of course, as with everything, it is not as simple as that either. Pastures that are managed with those considerations in mind in areas where the forage season is long work very well for many, and it is also possible to feed a poor diet on hay if the wrong species, nutrition balance and cuts are used. After considering all of the health aspects and our own capacity, we have chosen an approach that seems to suit our horses. We try to mimic the natural grazing behaviour with a few strategies. Our horses live on what is called a 'dry lot' where there is very little natural grass, but they have access to forage at all times, called 'free choice' or 'ad lib'. 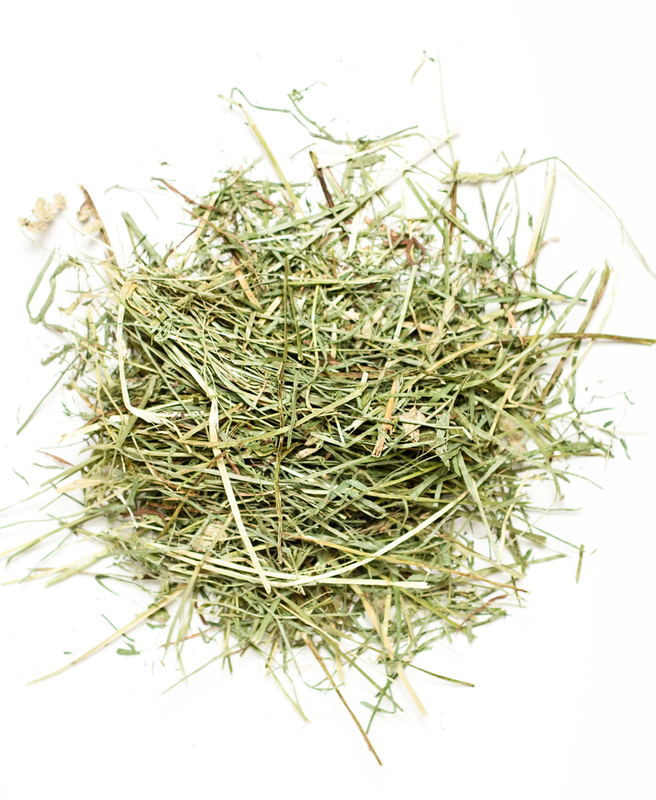 We purchase a selection of hay that is the highest quality available in our region - well made, free of mould and nutritious. The hay is distributed around the perimeter of the paddock in piles to encourage movement. We focus on the early season cuts which are more coarse and have a few benefits. With the more coarse hay, the horses will pick through to first eat the more tasty morsels then snuffle through each pile and do the same, before starting back 'at the beginning' and working through the piles again for the less palatable bits. In fact, they 'push' each other from pile to pile, and make several circuits of the paddock before everything is gone. This keeps them moving which is good for their feet and bodies and prevents them from ingesting too many calories. What horses mostly do all day . . .
We don't have to concern ourselves with concentrated feeds that are designed for high performance, which is a relief as they can present their own health issues, but we do have to be aware of a few special dietary needs. The hay that is harvested off of our local fields has a different nutrient profile depending on the species, time of harvest, soil composition and type of fertilizer that may be used. Each batch has a unique mix of vitamins, minerals, energy or protein and of course, it does not contain the variety that horses would find in a wild environment where there is no intensive agriculture. In order to ensure that they receive a balanced diet, each day they get a meal that has a fibre base with various supplemental nutrients added as appropriate and according to the needs of the individual horse. For example, in Eastern Canada, the essential mineral selenium is not present in the soil, so we have to add it as a supplement if it doesn't appear in any other dietary source. They may receive minerals in an additive such as kelp, fatty acids and energy in the form of ground flax, extra calories in oats, etc. They have free choice plain, loose salt available as well. There is a vast amount of information available about equine nutrition, much of it confusing and conflicting and we, as all horse stewards, try our best to ensure that they receive all the nutrition that they need, while trying not to 'buy into' products that are not needed and to mimic as closely as possible their natural diet. We try to do the same for them as we do for ourselves - keep it as simple and natural as possible. We rely on professional input from our veterinarian and others as needed as well. It is a constant challenge, but more and more, very good information is becoming available to help guide our decisions. In recent years, several individuals and groups have been practicing, promoting and perfecting the lifestyle that includes elements such as outdoor living, movement, fibre diet, etc. and we are pleased to be a part of the growing move toward this kind of horsekeeping.